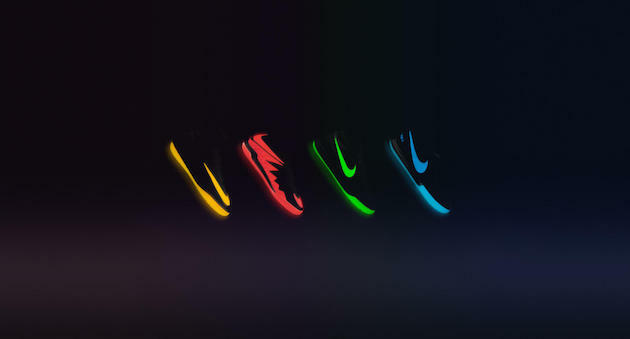 Did you think that Nike wouldn’t think about taking their Floodlight Pack indoors? You were quite mistaken! Today, Nike has dropped the Floodlight Glow Pack for all their Nike SCCRX fans, and these will certainly be an intense talking point for fans and players alike. Never one to avoid a bright colorway, Nike has decided to drench all their boots in one bright color…as if that wasn’t enough, they also felt that the Swoosh and outsole should glow in the dark. Overkill, you say? Nah, we’re calling “crazy enough to work” over here. With the introduction of the TiempoX earlier in the year, you can now find all four Nike silos crafted for the short-sided game. Let’s take a look at each entry into the Floodlight Glow Pack, and, if you’re brave enough to sport them, which one is right for your game. We start with the Nike headliner: the MercurialX Proximo. One of the first boots to bring knit, a quality build, and a lightweight nature to the indoor game, the MercurialX doesn’t sit by on ceremony…it makes magic happen! 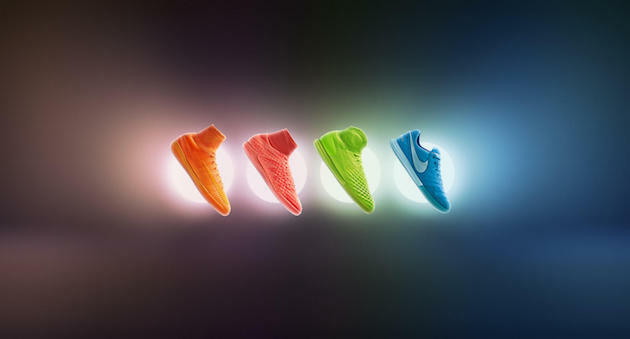 For the Floodlight Glow Pack, Nike will make you look like you’ve been eating too many carrots. 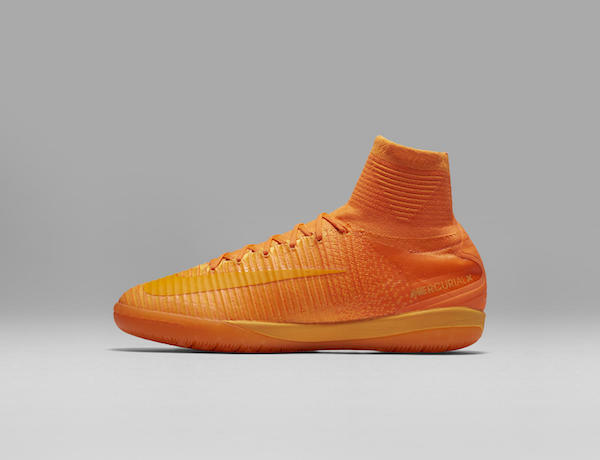 A bright orange boot from top to bottom, Nike claims that it fades into a Hyper Crimson on the heel, but its tough to see anything other than a bright creamsicle when these boots hit the floor. If quick flicks, nasty tricks, and blowing by your opponent at pace is your game, it’s time to bring some Tang to the game. The next boot in our rundown has to be the HypervenomX. 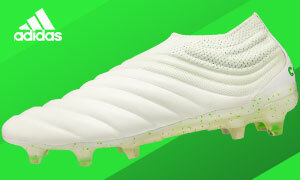 A perfect blend of what we love from the original Hypervenom and the updated tech, this boot is supposed to be the ultimate tool for players wanting the best in responsiveness. 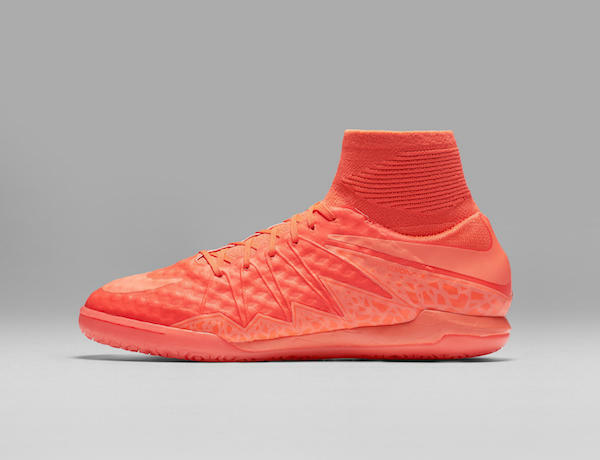 For the Floodlight Glow Pack, Nike has decided to give us one of their favorites: a red color that will come so dangerously close to pink, that actual arguments will break out between contradicting color connoisseurs. 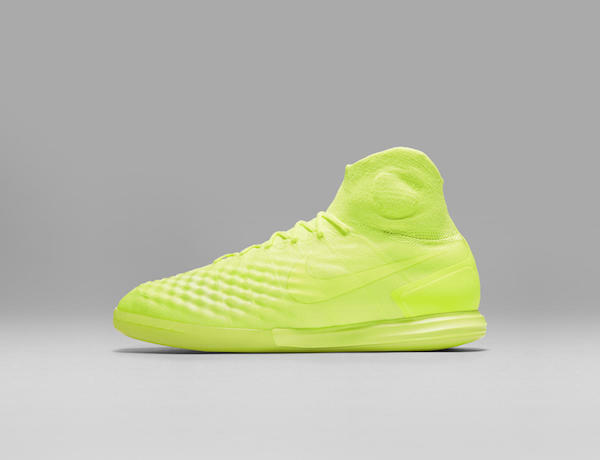 If the “glow in the dark” feature is what really draws you to this bunch, this boot has more that will stand out once the lights go off as the Hypervenom graphic also glows. Will that make your decision for you? If not, head towards the HypervenomX for a soft upper out of the box, a perfect fit, and the only Nike collar that isn’t attached to a totally Flyknit boot. 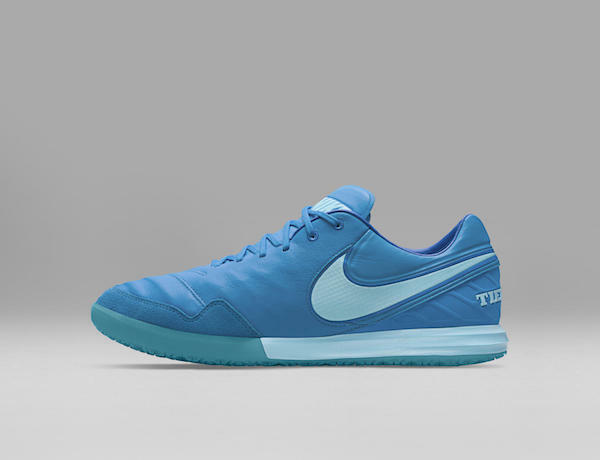 As we mentioned earlier, the TiempoX might be the newest addition to the Nike roster, but the Tiempo itself is an experienced warrior. A kangaroo leather upper means that it’s all good under the hood, and anyone looking for an old-school feel with new school sensibilities has a home in this boot. The Floodlight Glow Pack will answer the prayers for every gear head that’s been looking for some blue skies to break through their cloudy day. Completely doused in a light blue that Nike has lovingly called “Blue Glow,” these boots look like someone left them in the freezer too long. Tired of Scorpion telling you to “Get over here!”…? Freeze his skeletal rear end and show him what Sub Zero skills look like! Lastly, though certainly not least, is the MagistaX. It wouldn’t be Nike if there wasn’t volt, and, oh buddy, there’s a lot of it here. Soaked for hours in the massive Volt vats that Nike must have in their production plants, these can be seen from space! The visual equivalent of nails on a chalkboard for some, but, for others, it doesn’t get much better than this. Flyknit with a contoured Dynamic Fit collar, the Magista’s heat map takes a back seat on this outing while the Volt takes center stage. While fortune certainly favors the bold, these boots will favor anyone that decides to slip them on. An instant winner with its complete comfort and flawless touch, we feel walking around wearing a highlighter is merely a bonus! Oh, Nike…what have you done? While glowing in the dark isn’t usually something we factor in with our boot purchases, it never fails that we love this feature as if it could actually have a positive effect on performance. You’re telling me that we get to blind retinas in the meantime? Where can we sign up? 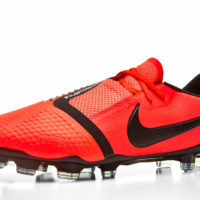 Keep an eye out (or squint to spare yourself from possible long-term damage) for these bad boys over at SoccerPro.com. When will these boots be released? Do you now something about that?